Wow, this is big news! A press release reports that a Canadian firm, Mackenzie & Macdonald Real Estate, has purchased DCUSA for $500 million ($6 trillion Canadian.) The developers will bring in a number of new tenants, including donut shop Tim Horton's, Hudson's Bay Company, an ice skate store, and a new venture, Arcade Fire 'Я' Us, featuring merchandise from the popular band. They'll be replacing the empty Lime Fresh space, Marshall's, Radio Shack and that weird vitamin store on the corner of 14th and Park. The name of the shopping center will remain the same, as the dual language requirement only applies within Canada. Pete Mackenzie of Hudson's Bay Company explained in the press release: "This represents a great opportunity for us to expand our brand to our neighbour to the south. 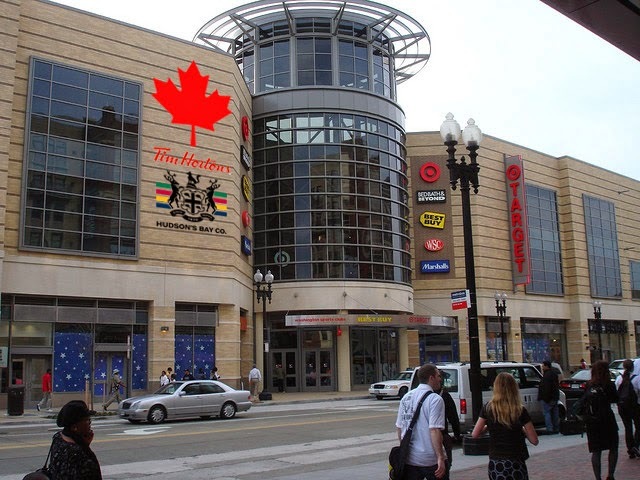 We are honoured to bring our store to Washington, where I hope the Americans purchase many beaver pelts or whatever it is that we sell. God save the Queen." The sale will be followed by a public event next Friday with appearances by Canadian superstars like rapper Snow, former Prime Minister Brian Boitano and some guys who apparently are famous hockey players. I'm told they'll have give away poutine, maple candy and those hats with earflaps. Both of your joke posts would probably be improvements over current conditions. My heart is broken knowing this isn't actually true. A Tim Horton's and (although not mentioned) a Roots store would make me so happy. Should be a nice shopping experience, aye. Lost Siamese cat: have you seen Morpho? Get free training for your nonprofit!